Welcome to Save the Pine Bush! Save the Pine Bush is a volunteer, not-for-profit organization dedicated to saving the Albany Pine Bush and Karner Blue habitat in New York State, a globally rare ecosystem in New York State. We stop developers by suing the government using environmental laws. The fight for Pine Bush presevation has all the elements of a good novel - except it is real. David vs. Goliath - volunteers vs. City Hall. Check out our current battles or read about how we got to where we are today. on April 19, 2017 here. Ward Stone spoke at our recent dinner. Listen to his excellent speech! 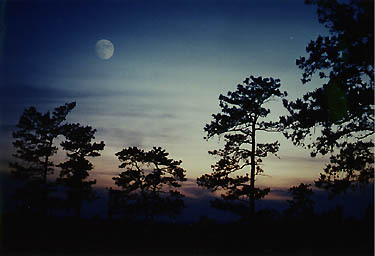 The Pine Bush at moon rise. Photograph by volunteer Doug Morse.